Just east of Waterloo is Blackfriars Bridge. It is a five span, wrought-iron deck arch; 923 ft long (280 m) and widened (in 1910) to its present 105 ft (32 m) width. The piers have decorative columns carved with freshwater fauna upstream and saltwater fauna downstream to represent the tides flowing under the bridge. The bridge was designed by Thomas Cubitt, built by P.A. Thom & Co., and owned by the City of London. It was opened in 1869 by Queen Victoria and named after the nearby Blackfriars Railway Station. Blackfiars Bridge carries both vehicular and pedestrian traffic. These old steel and iron bridges used to be painted a uniform dull gray, but in recent years, they have received careful painting which makes them much more attractive. The expense of a large maintenance staff is paid back by having handsome bridges that are protected from the deterioration that quickly destroyed previous Thames crossings. 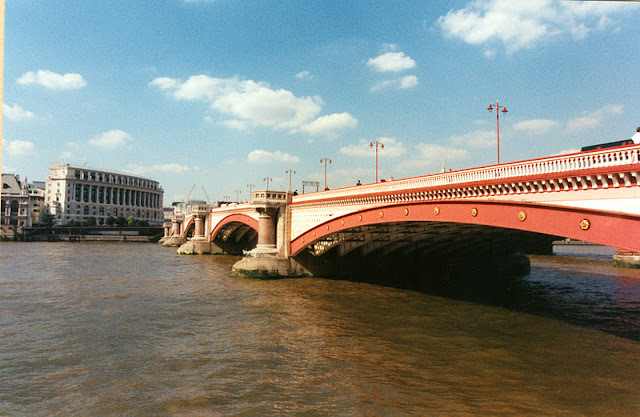 Thames River Bridges: Blackfriars Bridge by Mark Yashinsky is licensed under a Creative Commons Attribution-NonCommercial-ShareAlike 3.0 United States License.